Come on down and join the crew! Please feel free to stop by and visit anytime! In addition to our robust summer schedule, we are a year-round organization offering a number of special programs and events throughout the year. We invite you to drop by, take in the view, and have a tour of our wonderful campus. We look forward to meeting you! Pleasant Bay Community Boating is located on the Pleasant Bay waterfront where the towns of Harwich, Brewster and Orleans, Massachusetts meet, on the east coast of Cape Cod. 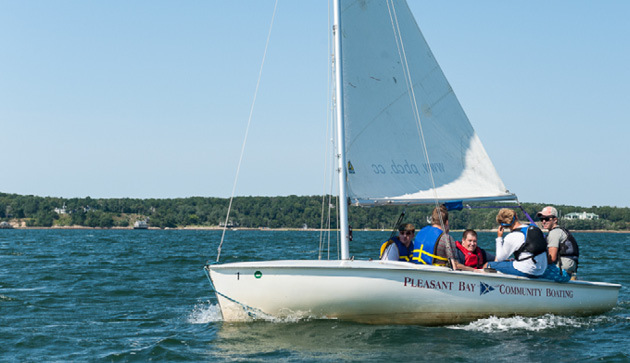 The largest estuary on Cape Cod and a jewel of the Eastern Seaboard, Pleasant Bay is a protected embayment which provides the perfect setting for boating, marine exploration and learning opportunities for people of all ages and stages. By car: From Rt. 6, take Exit 11, turn south on Rt. 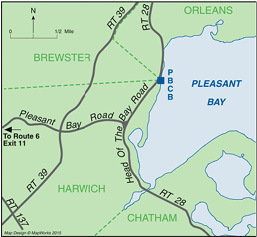 137 toward Chatham, and turn left immediately onto Pleasant Bay Road. Follow to the end. Turn left on Rt. 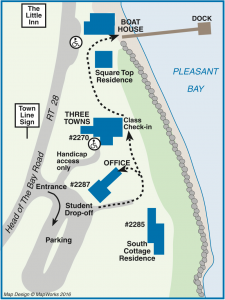 28, proceed 4/10 of mile to PBCB entrance and parking on right. If you are dropping off a student, turn into parking lot and continue around to the right. Stop at the base of the first driveway on right at bottom of hill. If you are the student, please park in a spot as available. Please note that Route 28 is a busy road, which should never be used for walking or student drop-off and pick-up.